There's no denying it: Meat Boy looks friggin' sharp in an ushanka. Last month, we brought word that Super Meat Boy creator Edmund McMillen was looking for help designing the box art for the game's retail release in Russia. The winner would be a piece of art that successfully made Meat Boy look cool, and look Russian. Well, the winner has been chosen! As you can see from the picture to the right here, artist MaadArtist's Super Meat Boy box art easily fills the criteria. I think that my favorite bit of the picture, though, is the pile of dead Meat Boys beneath the feet of the one still alive. It's very reminiscent of the actual game, where completion of a level will show all of your runs overlaid on top of each other - so you watch Meat Boy after Meat Boy die painfully in a spray of blood until one finally makes it. Congrats, MaadArtist. Not only do you get a new ACER monitor, but you get your work seen in game shops all across Russia. That's pretty nifty in any book. ... not only does it look badass, but it makes super meat boy look like he's goin to go through all the crap that he does in the game and totally be able to do it. "I got spiked in the face and buzz sawed in half and stomped by a giant robot, what did you do?" All power to golrious Soveit box art! Owww, thanks John, now I've got to notice the pile of dead Meat Boys I've failed to notice the first time around. That turns it from a good piece of cover art to a great one. Well, at least I'm not. but is it me, or does it seem Meat Boy is rallying troops to rescue Bandage Girl? I dunno. All those ushankas and kremlins (St. Basil's Cathedral, in fact) and Lenin statues are "export symbols". People in Russia don't associate themselves with this stuff and are often put off when they are offered a product full of such symbols. It's like that mock American Cave Story cover by Arne, with stars-and-stripes bikinis and apple pies and the fourth of july. If SMB was a Russian game and this was a box-art for an inernational version of the game, then yes, that would be funny and smart. But for most Russians this sort of cover would be insulting. Isn't that kinda... Insulting... to eastern Europeans in general? Nah, I don't think it's insulting russian people, at least if I were one, I wouldn't feel insulted, in fact, I'd say that the cover is just too awesome to be offended by it. But I'm not russian, so yeah. 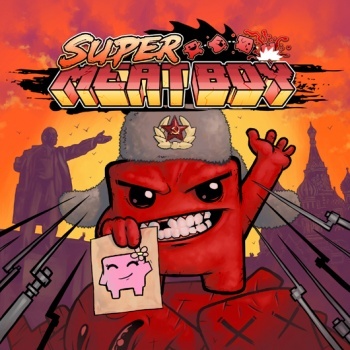 Also, let's not forget that the cover was made by an actual russian fan of Super Meat Boy. I think it's cool how the Russians take a stab at themselves for humor. It's... mature. Maybe it's shadowing, and I've only seen the picture on this site, but does it not look like the Lenin statue is wearing a bikini?